I use a lot of Ilford products, not surprising having worked for them for 21 years. I continue to use them because I consider them to be the best available on the market today. Here are a couple of brochures on Ilford and their products. This takes negatives up to 7 x 6 cm. It has a built-in filter drawer which holds Ilford Multigrade above the lens filters. It is also fitted with an Ilford Multigrade under the lens filter holder to make split grade printing much easier. Bought second-hand in early 1990’s. This takes negatives up to 7 x 6 cm and is fitted with an Ilford Multigrade under the lens filter holder to make split grade printing much easier. I have been asked for details of replacement lamps for Durst M670 color enlargers since the original Durst Colamp 100S is no longer available. The 12 volt, 100 watt spare lamps that I use are Philips EFP A1/231. They are widely available and are generally sold as projector lamps. Nova Archival Print Washers 20 x 16 in. + 20 x 24 in. Able to wash between 5 and 11 prints, one of the 20 x 24 washers has a Washaid slot. The Rolls Royce of flatbed FB dryers for fibre-based prints. Takes paper up to 24 x 20 inches (slightly more than the 60 x 50 cm quoted by Maco). Ilford 1250 RC Print Dryer Infra-red dryer from Ilford, 51 cm wide. The photographic layer in gelatine, coated onto the resin coated (RC) paper surface, is slightly melted by the heat to produce the highest possible gloss. It has constant temperature but variable speed to control the finish. A tall cabinet that looks like a locker but with a heater and fan in the base. Film hangs from clips in the top and it is long enough to take 220 film. Fibre based paper that can be processed to give archival prints that should last hundreds of years. Not easy to dry flat, often dries with wavy edges. Selenium toner can be used for archival stability and the colour of the image will change to a purple/black. 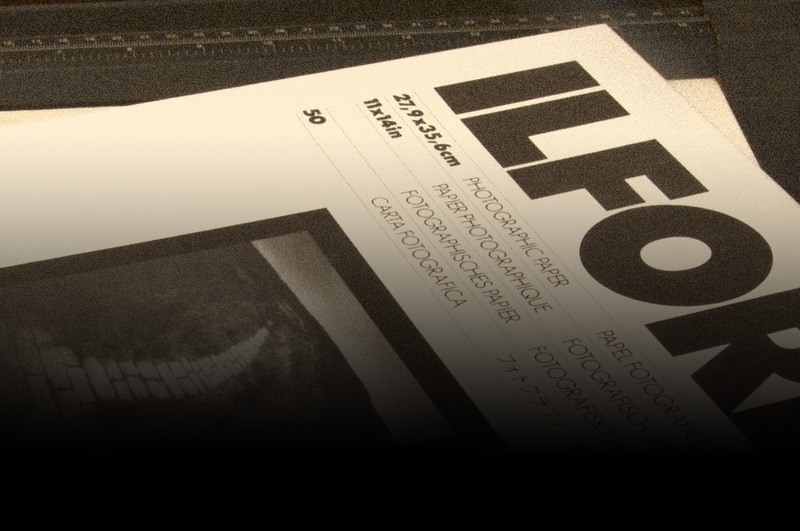 Here are the official Ilford technical information sheets for the new and old products. A paper coated on base that has polythene on both sides to prevent chemicals diffusing into the fibres. This means wash times are 5 minutes instead of 45 minutes for FB. Dries flat and easy to handle. This is my standard paper developer and gives short development times. Another good print developer with performance similar to Multigrade developer apart from a small shift in image colour on the slightly cold (blue) side. The development times are usually double those for Multigrade developer. Equivalent performance to ID11 but in a liquid concentrate. Probably the best film developer that Ilford make. It is also available as Ilfotec DD developer in 5 litre bottles – different name but same formula. Stop baths extend the life of fixer baths and prevent processing streaks. Ilfostop is made of citric acid (lemon juice) with a tiny amount of indicator. It is yellow when freshly made up and still in good condition. It is ineffective (as in useless) when the colour changes to colourless or purple. Been around for donkey’s years. Diluted 1+4 for film and 1+9 for paper. Ilford Hypam Fixer and Rapid Fixer have had identical formulae since the early 1990’s. Washaid reduces the wash time of FB papers considerably. Mamiya 7 and Mamiya 7 II cameras (6 x 7 cm format); 10 exposures on 120 film. Mamiya 7 lenses: 43mm, 65mm, 80mm + 150mm. I use B+W filters where I can. They allegedly use the same glass as Heliopan but with brass mounts. Sekonic L-508 Zoom Master and L-758D light meters. Ultra-lightweight for skiing, etc: Gitzo Mountaineer Mk2 G1028 4 section, 2 leg angles, carbon fibre; with Manfrotto 484RC2 quick release head. Together this combination of legs and head weighs just 1150 grams. It is very versatile and I carry this all the time when out on really strenuous trips or skiing with my cameras. Main tripod: Gitzo Mountaineer GT1541, 4 section, 3 leg angles, carbon fibre; with Manfrotto 486RC2 quick release head. This is a slightly larger heavier tripod but it is more sturdy, higher and more versatile so it has become my preferred tripod. Head and legs weigh 1554g so it is still pretty light. The head is reasonably solid too. I also have a Gitzo GH1780QR quick release head but it was too fiddly to use in cold temperatures. The plate on the camera sticks on pushing into the slot and the locking spring mechanism failed to release on several occasions preventing the camera plate sliding into place. Very fiddly to use. Not recommended. Message to self, put it on eBay! LowePro Street & Field Specialist 80AW + chest harness. This is a rigid, practically indestructible, case with carry handles on 2 sides as well as wheels. It can also be used as a seat with a back rest; very useful in airport queues! It fits into airline overhead luggage racks. External dimensions 55.9 x 35.1 x 22.9cm. “I use this for city photography so that I do not have to carry camera gear around my neck or on my shoulders. Very useful if you have a bad back like me. Not that useful over cobbled streets where it has to be carried, also not recommended for use on the hills, it gets stuck in the mud! Lens and camera wraps by Skooba Roadwired Advanced Protection System. These are squares of fleecy protective fabric with a mesh liner and velcro closures on all 4 corners. They come in different sizes: 12 inch for lenses, 15 inch for camera body, 20 inch for camera fitted with lens. I also have 2 old CCS lens cases that I can clip to the outside of my camera case when carried on a shoulder harness. These take the 65 mm and 150 mm lenses, when I think I will need them. This is a small rucsac of 35 litres. It is just large enough to take the Inverse 100AW case with camera and 2 lenses along with waterproofs, water, and warm layers. The Specialist case is too large. A medium speed film with an ISO of 125. I use it at this rated value. A high speed film which I use at an ISO of 500 instead of the rated value of 400. Infra-red film that only gives the effect with the correct filter (Heliopan 715, Hoya R72, Ilford SFX gelatine filter). The effect is only seen during periods of sunshine. Satmap12 with full Ordnance Survey 1:25,000 mapping for the UK. I also have the map cards for Germany, Norway, Switzerland, Austria, and French Alps. At present this is the best gps I have seen. It’s like looking at the local detailed walking map but with your position marked on it. Black Diamond Icon LED head torch. This is one of the brightest head torches on the market. Used to find the way at night. I also have a Black Diamond Storm headtoch for use in cities, it’s smaller and lighter than the Icon and both have a red light. This lets me use a small amount of light to find things in the dark in the camera case in cities but not so bright that I lose my night vision. Nikon Super Coolscan 9000ED film negative scanner which scans negatives up to 9 x 6cm at 4000ppi. Used with a special carrier with glass top and bottom or film curl is a problem. Scans from 7 x 6cm negatives produce prints almost 1 metre in size at 300dpi. Nikon no longer support their scanners with software to run them so I use Vuescan, it’s reliable and effective. I use the Kodak TMax 100 preset with 0.5 to 0.7 contrast setting. For editing I use Adobe Photoshop CS6 on an iMac with a Wacom Intuos 4 tablet.